Written by A Yorke-Bramble, S/Ldr. The writer, invalided from the Royal Air Force in 1918, attended a gliding meeting in 1922 on the Downs near Newhaven, organised by a national newspaper. At this meeting the Frenchman Maneyrol, in a small machine with a tandem wing-plan, put up a world record time for soaring (ridge) of 3 hours 20 minutes. Unluckily he was killed shortly afterwards in France when the machine broke up in mid-air. An interesting assortment of gliding machines attended that meeting; one being made from an old aeroplane. This was at a Press-sponsored meeting organised in the Itford area by the recently formed British Gliding Association. It was from there that Robert Kronfeld, by then the world’s soaring ace, made his soaring flight (partly ridge and partly thermal) to Portsmouth. In the nine years from then until the outbreak of the Second World War, the story of the club’s checkered career is of considerable interest to any airman. and would fill a tidy-sized volume. Space here of course, permits only a few references. 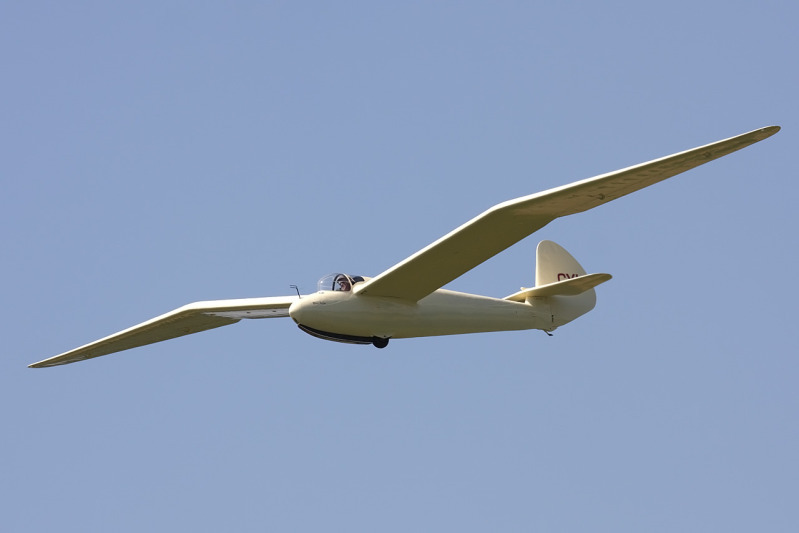 Gliding and soaring began in the club with the primary glider know as the ‘Zogling’, a specimen being purchased second-hand and put in order. Bungy and car launches were made in the area of Devil’s Dyke, Brighton. There was the eternal problem of finance, also of voluntary duty and of the storage of the machine, consistently being derigged and re-rigged. Eventually this unfortunately led to a split in the Club, the breakaway group being known as the ‘Southern Counties Soaring Club’ or, briefly, the ‘Southern Soarers’. Shortly afterwards this group was approached by the ‘Surrey Gliding Club’ (members of which had been joining in gliding at the Brighton sites) as to possible amalgamation with the Southern Soarers. Eventually this was negotiated between officers of the Surrey Club and the O.S.’ the latter acting on behalf of the Southern Soarers. Before long the residue of the original Skysailing Club returned to the fold – the whole now being registered as the “Southdown Gliding Club, Ltd”, and the name has remained the same since. To complete this part of the picture of the club’s development, it should be noted that for some time there existed a sister organisation, known as the ‘Southern Gliders Social Club’, accommodation for which was found (with a bar) on the premises of the O.S. This helped to keep the club together through some difficult times. Before the club had settled down in its finally constituted form on a permanent (?) site, it had made two or three moves along the South Downs, generally in the area to the NW – NE of Brighton. For a brief period it was ‘site-host’ to the London Club. The various moves compelled the O.S. to give very much of his time to investigating possible sites and negotiating for more permanent site-tenure, which he fortunately was in a position to do. At one site – Balsdean, east of Brighton – the club was host to the 1931 ‘International Meeting’, as recounted in the book – ‘Gliding and Motorless Flight’ (Pitman) pp.31,32,33 – and where is reproduced the O.S’s site-map of the area, with names of several gliding personnel of those days. The results of the competitions of that meeting, by the way, gave members of the Club a good place amongst others; and they give or make interesting comparisons with those of present-day common- place soaring flight. The final pre-war move was to Atlingworth Valley, NW of Brighton. Here was a site providing shelter for buildings, ‘safe’ slopes for lengthened ground hops with a plateau region for winch launching, with potential ridge-contacts on the NE, N and W slopes of the spurs of the South Downs in that region. The snag was the short tenure. The best the O.S. could negotiate was for 12 months. This impinged on the larger problem of capital to provide hangarage etc. Publicity for the club had been stepped up and the O.S. had arranged a dinner and ball at the Grand Hotel, Brighton. The Mayors of Brighton and Hove attended as Patrons. The club’s two-seater fuselage with detached wings was on show at one end of the ballroom. Membership applications were increased. At the official opening of the new Club premises, by the Mayor of Brighton, he took a flight in the Club’s two-seater. Gordon England, Kronfeld and other gliding notabilities were present. Considerable press publicity was given to the Club, which, from then on, continued to develop. It is interesting to note the date of the opening of the Club’s new building, 1st Aug 1936 – and to recall that some twenty years and a second world war later – 20th Sept 1956 – Lady Gage declared open the new hangar of the re-constituted club at Firle. A programme of the 1936 opening (and the following competitions) has been preserved and gives interesting facts, mentioning the Lawford Memorial Plaque and the Club trophies including the three cups: Lawford, Leaney and Yorke which should still be in the possession of the Club. Kronfeld and Latimer Needham gave demonstration flights in sailplanes, in a power-driven sailplane and in one of the ‘Ultra-light’ aircraft then appearing. The Chairman of the Club at that time was the late R.F. Dagnall and the Treasurer was the late Dr V.C. Hackworth. R.F. Dagnall was the Chairman of the old Surrey Gliding Club, which as told above, had been amalgamated with the Southdown Club. He then became the latter’s Chairman. His firm – ‘R.F.D.Co’- built some primary gliders of the German Zogling type. The O.S. proposed additional fitments to this glider to transform it into a secondary type with a pilot’s nacelle and with fairing–off pieces at the wing roots. The front part of the nacelle was spring-held and with the wing-root pieces, was detachable, rendering the machine a primary at will. The R.F.D. Co. then made a Zogling for the Club incorporating these modifications and we called it a ‘Dagling’. As a secondary machine its performance was greatly advanced on that of its primary configuration. Successive gliders of this modified kind were then known as ‘Daglings’. It is only fair to add that Reg Dagnall’s designer turned out what, for those days, was regarded as a ‘high performance’ sailplane – “The R.F.D”. Through Dagnall’s generosity this machine eventually became the property of the Club. Our launches included tows by car over a hill-brow for glides to the bottom. We employed also bungee-launches, by crew and by car and winch launches. One of the more interesting forms of launching we tried out (firstly at Palsdean) was by ‘Trio-launch’. By it a small party of only three persons could operate completely, wing-tip-holder-and–signaller, Pilot and car-driver. The tail end of the glider was held through a quick-release operated by the wing-tip holder, who signalled to the driver. The latter had a cable running from the glider round a ground-pulley thence, at right angles, to the glider’s line of flight; but sandwiched between cable and car was a four stranded bungee. Ahead of the car was a flag at a pre-determined distance. When the car reached the flag the glider was released, the tow- ring dropping off the glider hook as it passed over the ground-pulley, at (limited) required height. Another development in launching was winch-glider contact by phone with the pilot, from time of sitting in the cockpit to cast-off at altitude. A small winch-drum of telephone line (single) was used, the main cable being employed as the earth return. Detachment at cast-off was automatic. The pilot could virtually control the winch throughout the launch – useful in gusty conditions. Most of the hill-brow launches were aimed at starting of ridge soarings and sometimes with the object of gaining enough height to set off, in favorable conditions, across country. Records showed some success in this. The two- seater that the Club possessed (pre-war) was the B.A.C. VII, designed and built by Lowe-Wylde. When fitted with a light air-cooled twin engine this machine was known as the ‘Drone’. Kronfield flew one across the English Channel. But, engineless, its proper name was the ‘B.A.C. VII’. As to crossing the Channel, a Club member, Lissant Beardmore, was reported in the daily press as having crossed in his own sailplane after being towed to sufficient height to glide across. Other members with their own machines included R, F. Dagnell (R.F.D), G.A.Little (Tern), A. Dunning (his own construction), W. Filmer (Grunau), and S.G. Stevens (Slingsby). The O.S. built a ground trainer with a B.A.C VII fuselage and a B.S.A. 500cc motor cycle engine with a prop specially designed by G.A. Little. Some of these machines were demonstrated at air displays at Shoreham Airport, where we provided a running commentary for the gliding items. In 1939, with the approach of war, the O.S. had been invited to join the tutorial staff of the local centre of the Royal Air Force Auxiliary |Reserve, and indeed was preparing to return to service with the Royal Air Force. So, regretfully, he had to resign from the position he had held in the Club since its foundation – a club which had grown from a small group of inexperienced enthusiasts, with one second-hand primary glider, ‘living in a suitcase’, to a thriving organisation with site-tenure, club buildings, gliders, sailplanes, tow-cars, winches, equipment, club furnishings, electricity generating plant etc. He was given a presentation and a Life Vice-Presidency of the Club. Later, after the war, he was a guest at an Annual Dinner of the Club, presided over by Sir John Salmon, and was privileged to speak of the Club’s earlier days. But the Club, as it is today, owes its condition and position to a large extent to a succession of members who have given unstinted and devoted service in its development and progress. This is a copy of an article by A. Yorke-Bramble. S/Ldr. Dated 30 December 1965.